It was inevitable that Randall Ng would make this video. Remember to dress classy and dance cheesy! This vid is hosted only on the www.youtube.com/ngsmoov channel. This video was NOT made for profit. ATTENTION: Ripping and reposting any of my videos onto other YouTube channels is NOT PERMITTED and will be reported. 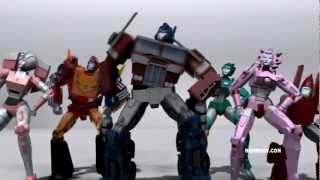 PSY - GANGNAM STYLE (강남스타일) ft. TRANSFORMERS video by Randall Ng. PSY - Gentleman: 4 Million View Thank you Gangnam Style Randall wants to thank all the people who have made Gangnam Style ft Transformers pass 4 million views! 3D TRANSFORMERS The Return of live action optimus prime!